THIS SWEEPSTAKES IS NOW CLOSED. Thank you to all who participated! I enjoyed hearing what you would love to try at Alloy Apparel. 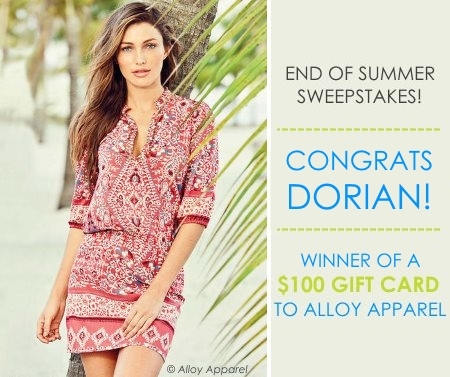 The winner, Dorian A., will receive a $100 gift card to use toward the 35" inseam pants and jeans she is looking for. Congratulations! For those who didn't win this time, don't fret! 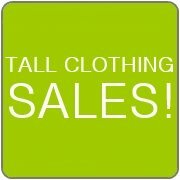 I'll have more tall clothing sweepstakes in the future. If you haven't already, feel free to sign up for my newsletter or follow Tall Women Resource on Facebook or Pinterest so you don't miss out on the next one! It's been a whirlwind of summer fun for me. Daily pool outings, fruity drinks on the patio, playdates with friends, ice cream cones, and a very much-welcomed beach vacation. But, it's August now and things are slowly winding down. As I start saying my goodbyes to the summer, I'm getting excited for the next season. New fall fashions have begun to pop up and I see many things to love! To celebrate the end of summer, Alloy is giving one lucky Tall Women Resource visitor a $100 gift card to purchase some new beloved finds, be it a summer piece or fresh fall style! Entering the sweepstakes is easy. Simply leave a comment in the form below telling me which item(s) from Alloy Apparel you would love to try. Then, on the next page, you will confirm your entry submission. And, that's it! Entries must be posted by 11:59 P.M. CST on September 11th. One winner will be chosen at random and announced the next day. Good luck! The French Terry Boyfriend pant! I can never find a pair of comfy warm pants to relax in that are long enough but these look great. They're a reasonable price too! Any pants or jeans that are long enough for 35" inseam!! Thanks! London super stretch skinny jeans. My inseam is 37 and have heard this is the place to buy long jeans. I would love to try lots of what I saw, but I think I'd start with a dress. I can't remember ever being able to buy a dress that was actually made for someone with my torso. Plus, I really like that you have plus sizes. I'm not only tall, I'm built like a linebacker. Even when I was skinny I was still considered plus sized. I would love some of their new maxi dresses, 39" jeans, and 37" pants. A dress. A decent dress for a wedding, church or dinner out. I'd love to try the Abbie Maxi dress! It would be so nice to have a maxi dress actually be long enough for me at 6'2! I'm in love with the grey ribbed Gisele side split dress. Gorgeous! I just saw in their catalog that they have coats in talls! I would love to try one of the Steve Madden ones! Or I love their extra length dresses as well! I would love to buy any of the tall pants/jeans and maybe a new top as well. It's so hard to find anything long enough for me. Twill essential boot cut pant. Tall 35" inseam. I would love to try the Olivia printed embellished dress! It's hard to find cute short dresses that cover my booty! Digital floral print ponte knit dress is gorgeous and would love to rock this item!! I would love to try the tall jeans and actually the entire tall line. I have lost some weight so I need a really nice pair of skinny jeans. Yes a new wardrobe for the new school year will keep me in the latest fashion. I LOVE the maxi skirts! I'd love to try some bootcut jeans, and that peasant top. I also like that patterned hooded cardigan. I would like to try the Spoon Motto Jegging. They are long enough for.. I'd like to try their end-of-summer / beginning-of-fall dresses. Abby Elbow Sleeve Scoop Maxi Dress. It's the dress up, dress down anytime dress! I would like to try the Paris Color Skinny Pant Jeans to look relaxed and colorful at work. Would love to try the dress pictured if it is available in an 8. So glad I just found your site. Olivia Printed Embellished Dress. It's beautiful! Great pants of all kinds! Love the long inseams! Amber (blue) or Olivia (black/white) print dress I can wear either as a tunic top for dress over pants style. I would love to try their jeans. I am tall and need the length. There are several items that I would love to have for the fall. I have purchased before and see some things in your catalog that I want now. I would love to try on the Giselle side slit dress and the Steve Madden Princess funnel coat in camel and the Marilyn sweater dress. The Heidi ribbed maxi is something I would love to try on as well! Zoe Angel sleeve dress...heck, ALL the dresses! The twill essential boot cut. I've always wanted a pair but have never found any that fit me! I would love to try any pants or jeans. Us tall women need options. I LOVE the ballet flats that actually come in my size! I want one of each! Would love to try the Charlotte Striped Maxi dress, Rocker Bootcut Jean, Larissa flutter sleeve top, scoopneck thumbhole tee, and many more. Stitch pocket boot cut Jean. I love your long pants! I would love to grab the new Ricki boot in black and brown! It's hard to find cute boots that are the right size! I would love to have the Faux Fur Cascade coat. I would love to try any pants with an inseam of 36"! I am looking for white jeggings with boot cut. You used to carry a line called "revolt" and the jeggings were fantastic. Now I cannot see them. a short dress with a tall bodus... like those cute junior dresses my niece can wear. I'd like to try the French Terry jogger! You have them in my LENGTH!! That's very hard to find! I'd love to try the rocker stitch and denim trousers! Charlotte Embroidered Peasant Blouse. Love it! I would like to try the Corduroy Skinny Pant. I would like to try on a jumpsuit. I really really want a pair of PJ's with long enough trousers rather than looking had row with my ankles.